The 12K combines first-class performance with incredible versatility to create a system that's easy to operate, yet feature-packed! Available in systems perfectly matched for airplanes, helis and gliders, the 12K is also compatible with multi-rotors, so pilots get the best of all worlds. 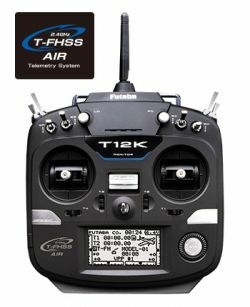 Equipped with the rock-solid Futaba S-FHSS and T-FHSS protocols, the 12K is compatible with almost a dozen different Futaba receivers to suit modelers' needs. The 12K can transmit and receive telemetry data via the T-FHSS protocol. Simply install Futaba telemetry sensors (sold separately) to monitor flight data, receive alerts while in flight and more. These sensors allow pilots to keep track of battery voltage, altitude, speed and other key flight functions. In addition to telemetry, the 12K can be used with S.Bus2 gear to add multiple servos, gyros and more to set-ups with fewer cables. Pilots with non-telemetry set-ups can take advantage of the interference-free S-FHSS protocol. A large, backlit LCD screen, expandable 30-model memory, a 6V 1800mAh NiMH battery and charger are just a few more of the features the 12K has to offer. 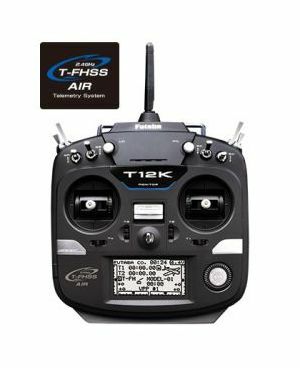 Choose from airplane and heli 12K systems with the R3008SB telemetry receiver included. FPV/drone pilots will appreciate the lightweight, compact R3001SB FPV drone receiver optimized for their applications. 12K transmitter, 6V 1800mAh NiMH battery, charger, and receiver specified below. T-FHSS system receiver mode. Applicable with the telemetry sensor unit. Up to 18 channels (linear 16+ON/OFF2) can be used. S-FHSS system receiver mode. Up to 8 channels can be used. © 1998-2019 Perth RC Models & Hobbies.